Hopefully, Bohemian Spirit, on the Upper East Side, will still be open when you read these lines. This is a very legitimate concern, as the spot, located on the ground floor of the Bohemian National Hall, has been occupied by 4 consecutive restaurants in the past 5 years, 3 of them in only the past 2 years. 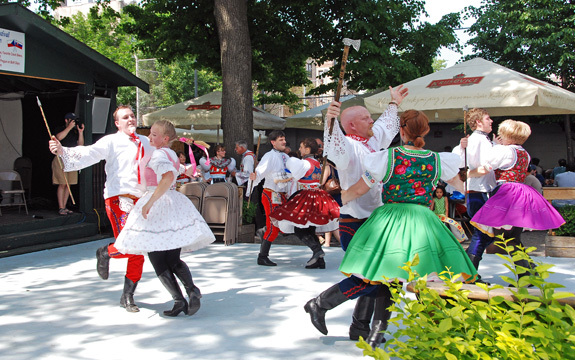 First there was Hospoda and its haute Czech cuisine. Then came Hospoda 2, which offered more down to earth Czech grub, albeit with the same careful execution. Then there was BKB Restaurant, with the American chef who thought he could replicate the summer success of his Hamptons seafood restaurant year-round in Manhattan. And now we’re finally back to Czech food. 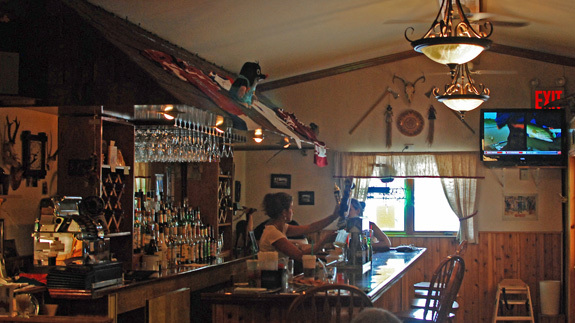 The restaurant space hasn’t significantly changed throughout its many lives. While waiting for your food (and wait you will), you can challenge your dining companions to recognize which elements of the decor and dinnerware have been carried over. The hardwood floors are Hospoda’s, but I definitely congratulate the interior designer for not taking the atrocious ceiling umbrellas out of the attic. BKB’s barely-used chairs, tables, and white cabinet are still there. 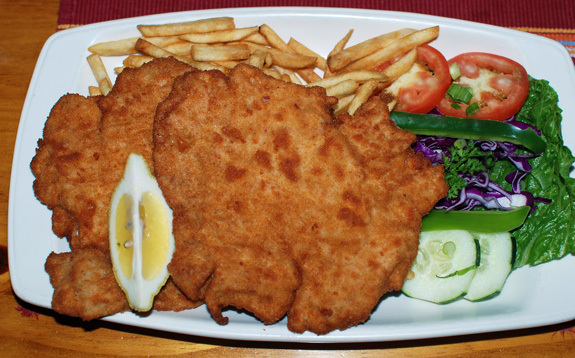 I recognize some of the plates from Hospoda 2 and even Hospoda 1 — compare the schnitzel below with the one here! During its recent Long Island fling, the place also acquired bar seating (a sensible addition in a New York restaurant), and Hospoda’s beer kegs are back under the sea-through bar counter, with its too-Miami blue neon light. Even some of the chefs are recycled; in an explanation that I didn’t quite follow, I was told that the current chef used to be the pastry chef, or some other kind of chef, at Hospoda, or at BKB, or both. I’m not the first to review Bohemian Spirit, of course. The New York Times already published Ligaya Mishan’s review over a month ago: there are pictures of dead Czechs on the wall (Vaclav Havel, Aja Zanova); old people come out of concealed doors to speak and sing in a language Mishan doesn’t understand; the menu is cheap, the dishes déjà vu, and the service far better than it will be when you go there yourself. Mishan enjoyed the experience. The menu, which starts with a curious, typo-laden overview of Czech cuisine more fit for a travel guidebook, includes many Czech classics: tartare, sausage, fresh vegetable salads, hearty soups, schnitzel, goulash, svíčková, duck, dumplings and pancakes of various kinds, strudel… Appetizers all cost a mere $6, and entrées range from $14 to $19. The roasted beet salad contains many things beyond roasted beets: raw tomatoes and red peppers, flavorful farmer cheese, and dill. I wish there was more of that excellent cheese, but this is a nice, simple salad. With summer now behind us, you might prefer a soup, and the vegetable one will warm you up with its very rich taste. The soup is thickened with potatoes and full of chunks of carrots, mushrooms, and probably onions, topped with parsley. It comes with thick slices of excellent rye bread. I like it. The beer roasted sausage is served with the same rye bread. The sausage is very good, tender inside and not too greasy, with a smoky taste. The sauce, on the other hand, is a bit of a mystery. I can’t taste beer at all, and I’m reminded of some kind of sweet barbecue sauce. What’s in it? Tomatoes and onion chunks? Probably. While I agree that a hint of sweetness would go well, here there’s simply too much, to the point where it partly masks the sausage’s flavor. The beef tartare, which comes already prepared, is quite good. As usual, I deeply enjoy the toasted and generously greased bread slices that you rub with a raw garlic clove. The meat is mixed with chopped onions and gherkins, plus a slightly sweet condiment of unknown variety, and topped with parsley. Maybe it’s a bit too sweet, yet again, but I do like that it’s still mostly meat, not a mixture drowned in sauce. It transports me straight back to Czech Republic, as they say. 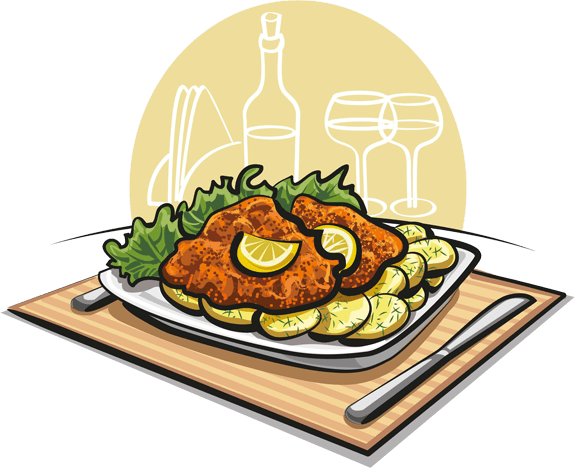 The veal schnitzel is pretty much identical to what was served at Hospoda. The pickle has been replaced by a slice of lemon; we’ve lost the double serving of meat and gained a side of cucumber salad (cucumber, sour cream, dill), which certainly makes the dish more balanced. Other than that, the meat is still thin and tender, the breading crispy and not overly thick, and the potato purée unctuous. Maybe the veal is a tad salty, but overall this is a fine, classical schnitzel. 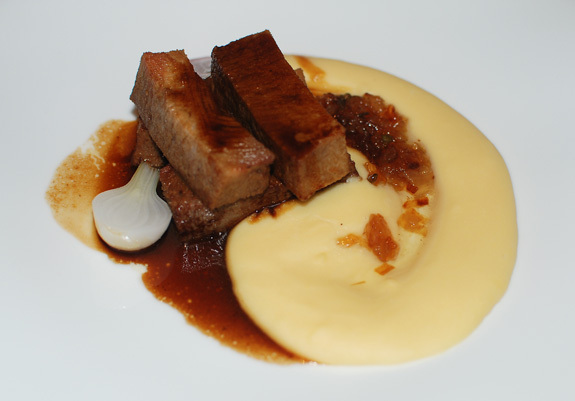 Next up, svíčková: beef (traditionally, the tenderloin) in a root vegetable sauce. 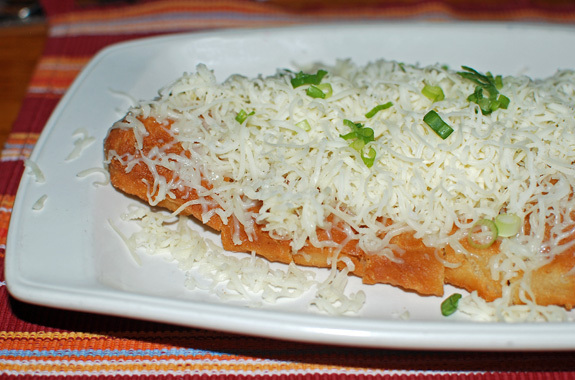 While this isn’t a dish that many foreigners know, Czechs consider it the yardstick of a cook’s skills. Bohemian Spirit opts for a slice of beef chuck cooked to perfection. As far as I can tell, it’s not cooked sous-vide like it would probably have been at Hospoda, but it’s still extremely tender, and fairly lean at the same time. The sauce is really excellent, very creamy, both slightly citrusy and slightly sweet. I can definitely taste a rich beef stock as well, but it’s hard to say exactly what else is in it. I know there’s supposed to be carrot, and I wanna say there’s orange juice (not just because of the color). On the side, four slices of bread dumpling hold the promise that you won’t leave hungry. As per usual, the dumplings don’t taste like much of anything and remind me of steamed bread, maybe with crusty pieces inside. This is way too much bread (not unusual), and I would happily trade half for another piece of beef chuck. Next to the dumplings lies one of the strangest garnishes I’ve seen in a while: dried cranberries resting on a slice of lemon and topped with whipped cream. 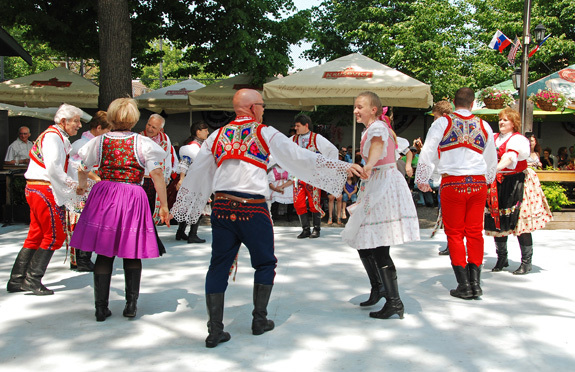 Now, look at pictures of svíčková online, and you’ll see that this is indeed the norm. WTF, Czech Republic?! I hear that the tart cranberries and lemon are meant to complement the richness of the dish. I could dig that, except there’s already citrus in the sauce. Adding red berries or red berry preserves to a braised meat’s sauce is even a classic pairing, but keeping the berries in a corner doesn’t work as well — why not add them to the boring bread dumplings? And the sweet whipped cream, which Bohemian Spirit is using instead of the usual sour cream, is even weirder and more out of place; again, the sauce is already slightly sweet. To conclude, an otherwise excellent dish marred by too many bread dumplings and the cook dropping somebody else’s dessert on the plate. To continue with the rich wintry dishes served with enough bread dumplings for a week, here comes the beef Stroganoff. If you’re a traditionalist, look elsewhere. The only two ingredients that this dish has in common with one’s idea of a beef Stroganoff are beef and cream. I am told (after the fact) that this is a “Czech Stroganoff” — something that will resonate with only a handful of people, especially considering that even my Czech cookbooks all stick to far less bizarre renditions. I’m all for rejecting the edicts of tradition and creating better dishes — after all, we don’t even really know when and how beef Stroganoff was invented, and recipes have varied widely across eras and countries, in terms of ingredients and preparation — but Bohemian Spirit fails at creating a better dish here. The meat is fine, lean but tender beef strips neither thin nor thick, more like stewed than quickly sautéed. The bread dumplings are the usual nudniks. It’s the sauce where things go seriously wrong. Firstly, it’s very, very creamy. The waitress did warn us that some people find it too creamy, and I should have listened. Then, it’s hard to identify what it’s made of, except for the overall impression that it’s not all that pleasant. There’s not much going on, no mustard, no tomato sauce, no onion… There are a few mushy chunks here and there, which we finally identify as mushrooms and pickles. The mushrooms seem like rehydrated dried mushrooms, and the pickles remind me of overcooked squash but with a sour aftertaste. I’m not thrilled at all. The beef goulash fares much better. It’s a canonical Czech goulash, tender chunks of meat with a sauce thicker than its Hungarian counterpart, probably made with tomatoes and onions (I don’t see any red peppers), pretty mild with just a hint of paprika. 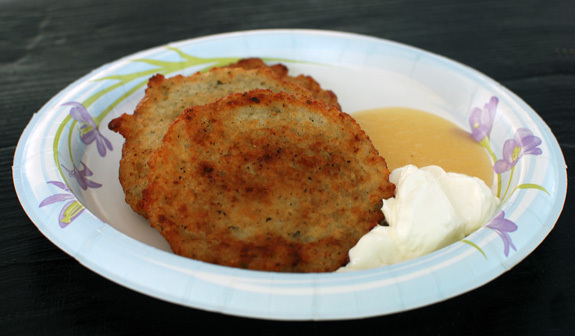 It comes with very good potato pancakes that are not made of coarsely grated potatoes, like latkes, but have a much smoother texture. They’re flavored with marjoram, and fried in a generous amount of oil. If you haven’t stuffed yourself with bread dumplings, you might have room for dessert. 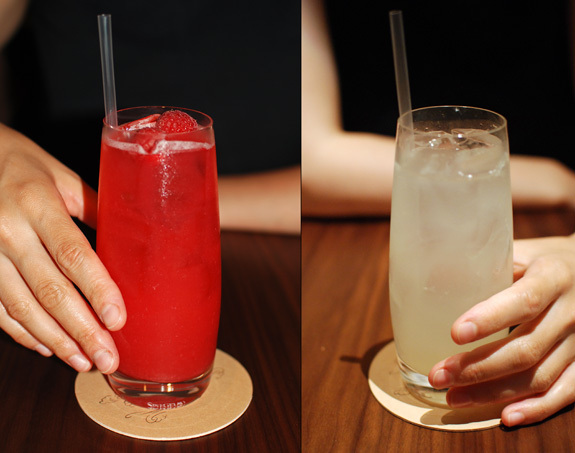 There are four homemade options on the menu. The prune buns (dukátové buchtičky in Czech) with vanilla sauce are my favorite. The vanilla crème anglaise is delicious, not too sweet, very light, with intense vanilla flavor coming from all those beautiful little black dots. The buns may have been toasted a little too much on the top, but they’re still soft inside. Each of them encases a whole prune, which is really more like a dried sour plum than the usual super-sweet prunes you find in the US (not that there’s anything wrong with either version). Overall this is a well balanced dessert, and I like that it’s not too sweet. The fruit dumplings with dark beer foam and gingerbread inexplicably cost about double the price of the other desserts. The dumplings, made with tvorog, are thick balls of dough filled with strawberries and cream. They’re quite good, if doughy. We were told that the chef always uses strawberries for this dish, whether they’re in season or not. If that’s true, then I would suggest either using seasonal fruits that don’t taste tart when they shouldn’t, or just calling the dessert “underripe strawberry dumplings”. The excellent dark beer foam is more like a beer crème anglaise that’s slightly foamy, and smells quite floral. The gingerbread crumbled on top isn’t bad, though it can easily be mistaken for any other kind of crumbled cookie. I quite like the pairing of beer with strawberries: the combination doesn’t even taste like beer, which is a good thing for someone like me whose’s not a beer drinker. Again, the whole dessert isn’t too sweet. It’s a good dish, but the prune buns are better. If you’re looking for something more familiar, try the apple strudel. The thin, crispy dough wraps around several layers of apples and prunes. No cinnamon, yay! Thank you! It’s served with whipped cream that could use slightly more sugar and a very average vanilla ice cream that doesn’t taste enough like vanilla and could almost be plain ice cream — a bummer after that delicious vanilla crème anglaise. Still, the strudel itself is very nice. There’s a full bar, and Czech beer on tap. Wine options are very limited, although the Czech red by the glass is quite nice. And the homemade soda from Hospoda is still here. The food at Bohemian Spirit is generally quite good, although most dishes need some small tweaks. The menu, which doesn’t seem to change much from visit to visit, also ignores seasons. During one visit on a hot summer day when it was 95 F outside, we were all eating stews, and the chef had chosen to serve beef Stroganoff as a special. I know that Czech food doesn’t really evoke grilled fish and avocado salads, but there should be some middle ground. Then there’s the problem with service. On a visit when the restaurant was nearly empty, there was nothing to complain about. But when during another visit the restaurant was nearly full and was also hosting a private party in a side room, it became rather disastrous. Not only because the kitchen was slammed, which would be somewhat understandable, but because half of the (already few) servers working that day were totally out of it. They’re friendly, but not uniformly competent. I regularly wonder why all of these successive restaurants at the Bohemian National Hall never thrive. The food, past all my nit-picking, is as good as or better than in many other eateries nearby that seem to be doing just fine. And I can’t imagine that the landlord charges an unreasonable rent. The service problems are definitely one big reason. There’s also been some decor faux pas in the past (the infamous ceiling umbrellas), but they’re mostly gone now (I remain dubious about the glowing beer kegs). I tend to think that the bar area is part of the problem, too. I don’t bet anybody goes there just to have a drink at the bar. Even with the new stools and tables where there didn’t used to be any bar seating, this is still not the most inviting space: there’s no on-point bartender, the lighting is too bright. Does anybody in the neighborhood even know that there’s a place that serves genuine Czech beer on tap? Shots of Becherovka? (Wait, they don’t have Becherovka on the shelves… is it in the fridge?) Given the general lack of bars on the Upper East Side, this, coupled with the affordable menu, sounds like it could be a draw. Just replace the beef Stroganoff with a hamburger — the ingredients are almost the same. 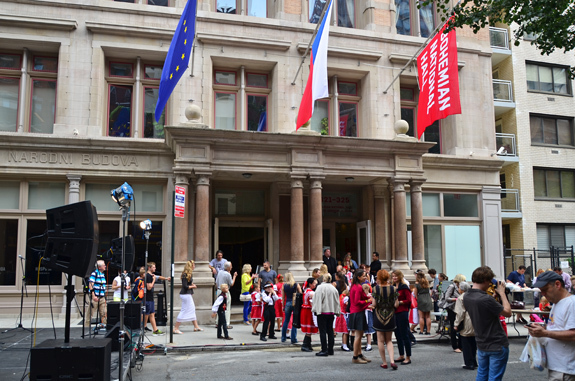 Last weekend in New York City, the Czech Center held the 15th edition of its annual Czech Street Festival. And unlike certain other street fairs better left unnamed, this one was actually interesting. 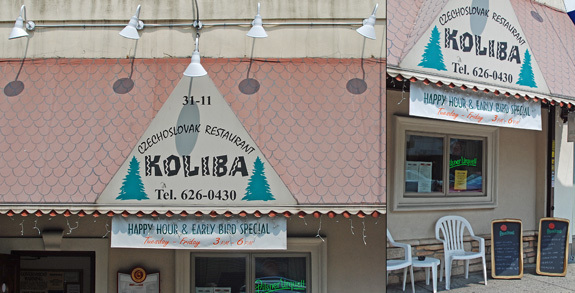 Koliba, which means chalet in Slovak, is located in Astoria, not too far from the Bohemian Hall and Beer Garden. And as you can see from the frontage, it bears the peculiarity of serving cuisine from a country that no longer exists, and even brags about it on its web site — look at that beautiful Czechoslovakia in red on the map! 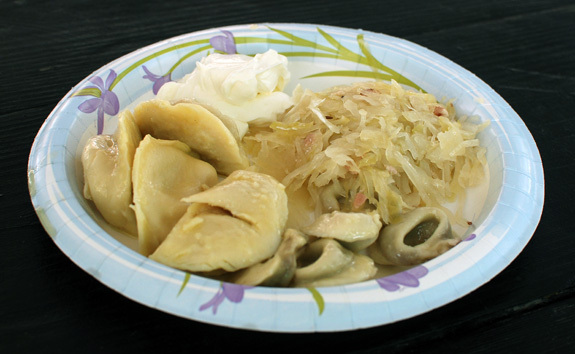 The menu, of reasonable length, lists many Czech and Slovak classics: beef stews, pork roasts, schnitzels, dumplings, halušky (Slovak spaetzle), klobasa (sausage). Before ordering, keep in mind that the portions are really huge. Judge for yourself from the pictures below, but most dishes are about double the “normal” size. 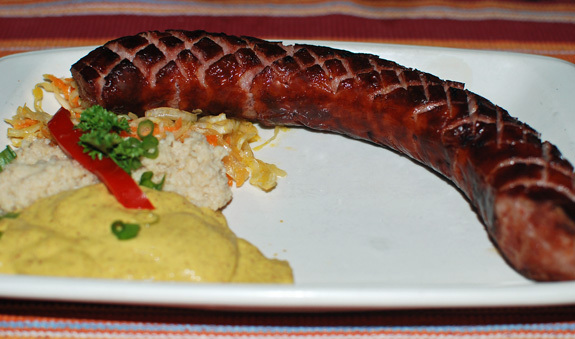 The grilled sausage was smoky and juicy, as good Czech sausage usually is. I actually wonder if Czech restaurants make their own or order them from a butcher — I would think the latter, which is fine by me. The langos arrived on a plate so large that it couldn’t fit entirely in the picture! It wasn’t bad, but the dough was a bit bland, with too much garlic and too much cheese. I would have preferred less cheese, but slightly melted. 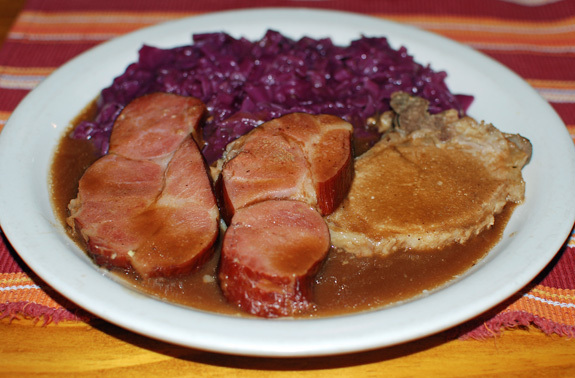 The combination pork platter consisted of roasted loin of pork and smoked pork with red cabbage (lots of it) with an order of bread dumplings on the side. The roasted pork certainly didn’t look like loin to me, but all the meat was properly cooked and tender. The traditional dumplings played their sauce-mopping role to perfection. The pork schnitzel (or schnitzels rather, since one portion includes two generous pieces) looked a lot like a chicken schnitzel, but was bland enough that we might never find out the truth. As is often the problem with schnitzels, it was rather dry. The dish could be significantly improved simply by adding some butter while frying, and serving it with an egg on top, and I don’t care if it’s not “the way it’s served in Czechoslovakia”! At least the fries were crispy. As for the under-ripe tomato and other tired vegetables, I’d like to shake the hand of a diner who actually eats them all. 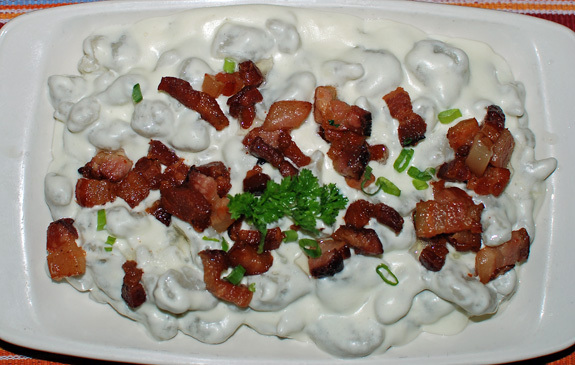 The halušky, potato spaetzle with sheep’s milk cheese and bacon, were borderline inedible. First, the spaetzle looked liked giant greenish-greyish gnocchi and tasted rubbery and undercooked. Then there was the monstrous cheese sauce. Sure, it looks close enough to the reference picture on Wikipedia, but this is just an illusion. I certainly don’t remember eating anything that gross in Slovakia. To be fair, the bacon was good, but this just wasn’t enough to redeem the dish in any way. The leftovers, minus the halušky that went straight to the trash, fed us for another meal and a half. I can only regret the quality didn’t always match the quantity. 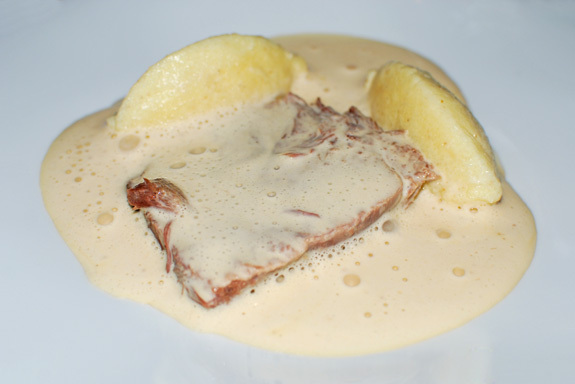 Oh, and if you’re one of those individuals with a special dessert pocket, they serve home-made štrúdl and crepes. 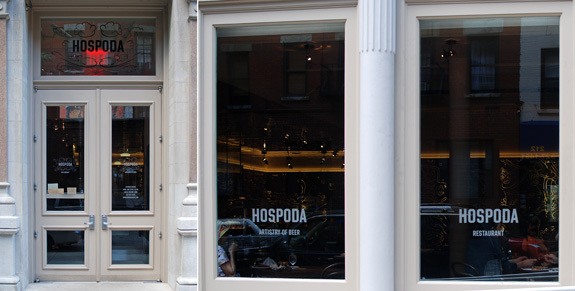 In a sleepy corner of the Upper East Side, Czech restaurant Hospoda recently opened on the ground flour of the Bohemian National Hall. And unlike its compatriots (such as the nearly homonymous Bohemian Hall) this is not a beer garden. Far from it, in fact, as I would regard Hospoda as the first attempt at Eastern European fine dining in the city. 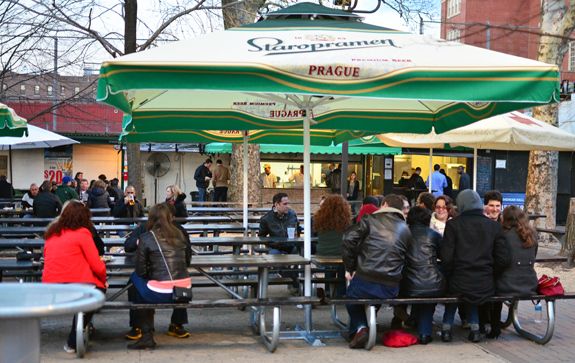 With the Czech Republic’s location in Central Europe, the complete reconstruction that followed independence, and the influx of foreign tourists and investments, it’s not surprising that Czech cuisine would be the first of the former communist bloc to recover from half a century of culinary deprivation — the first restaurant in Eastern Europe to receive a Michelin star is in Prague, never mind that it serves Italian cuisine. Hospoda means “pub” in Czech, and the place takes its beer very seriously. Only Pilsner Urquell is served on tap, but in four different styles. 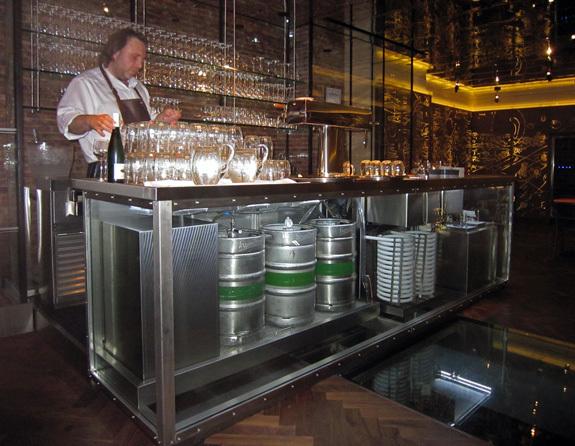 Beer kegs occupy all of the bar counter, and most of the cellar space that you can see through the glass floor in front of it. Although, since I don’t know of any truly decent place to have a drink in a 20-street radius (and also because I don’t drink beer), I can’t help but think that the space would be better utilized as a full bar area with stools. The menu is a rather short list of smallish plates organized as first and second courses (as I write this review, I see it’s been reorganized into 3 sections: Green Market, Chef’s and Czech). Small plates doesn’t mean three ingredients thrown on a board tapas-style, though. Instead, think of them as dishes sized for a tasting menu, with you deciding how many courses you plan to have. The menu changes regularly and many dishes are still being tweaked. Depending on your perspective, you can either commend the chef’s efforts or regret that he doesn’t wait until a concept is finished before putting it on the menu. 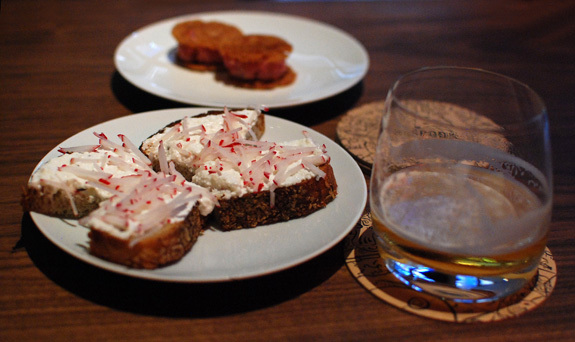 The meal started with two amuse-bouches: an unexpected beef tartar (I’ve never seen anybody eating raw meat in Eastern Europe) and toasts of caraway bread with cottage cheese and radish, accompanied by a beer sample. The duck breast with plums, thyme sour cream and shortbread was very nice and packed a lot of plum flavor, topped with little cubes of stock that melted in your mouth. 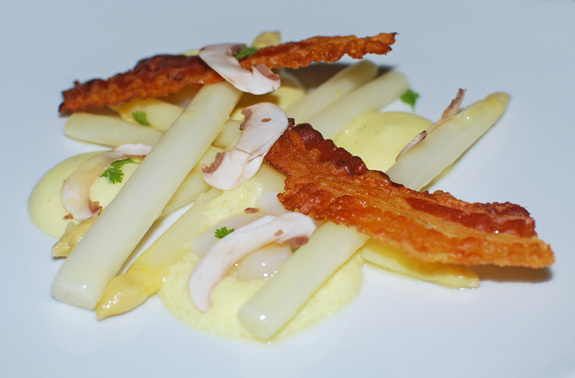 The white asparagus composition gathered many classic flavors — mayo, quail egg, mushroom and bacon. 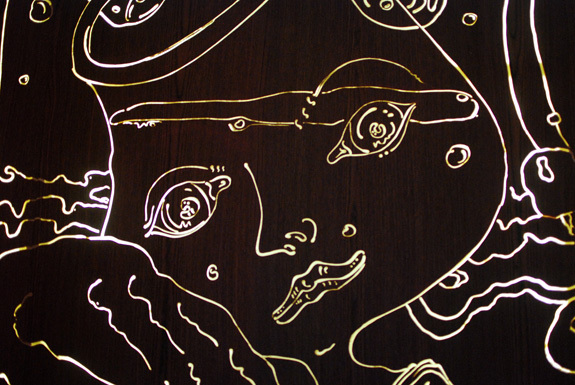 Great execution, but it lacked a little something to be really impressive. 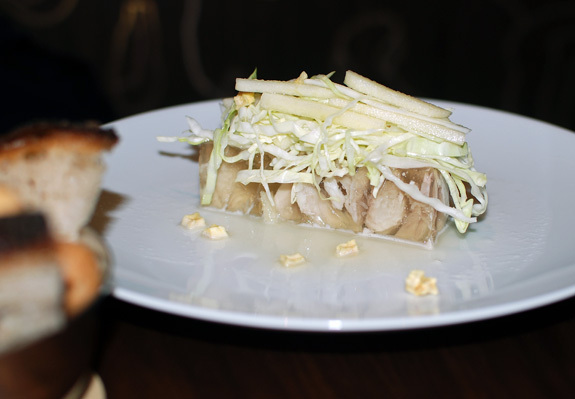 The rabbit aspic, covered with apple and cabbage was also well executed but rather boring, partly because I don’t really like aspic and I find American farmed rabbit bland. 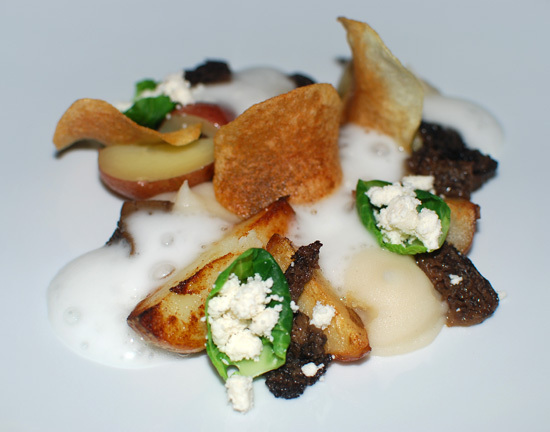 The potato variation offered 5 different preparations of the tuber with a nice variety of textures (purée, foam, chips, boiled, and roasted), mixed with morels, Brussels sprouts and cottage cheese. Although the potatoes tasted very good, some of them lacked salt, and I’d say that overall the dish lacked fat: whether it’s olive oil, butter, lard, or bacon I’m expecting a certain level of grease with my potatoes. I would have made the potato purée with a lot more butter, for example. 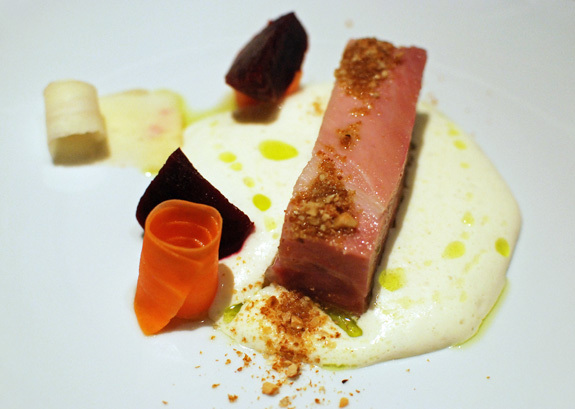 The Prague-style ham with its thick horseradish foam and assortment of expertly picked vegetables was the turning point where the food went from very good to excellent. The salty, smoky meat melted in my mouth and was perfectly balanced by the horseradish. The beef oyster blade with its creamy horseradish sauce and barley dumplings demonstrated the same qualities. The delicious slice of meat (that you may know as the flat iron steak in another context) was tasty, and fatty but not overly so. The slightly heavy dumplings were perfect to mop up the thick sauce. 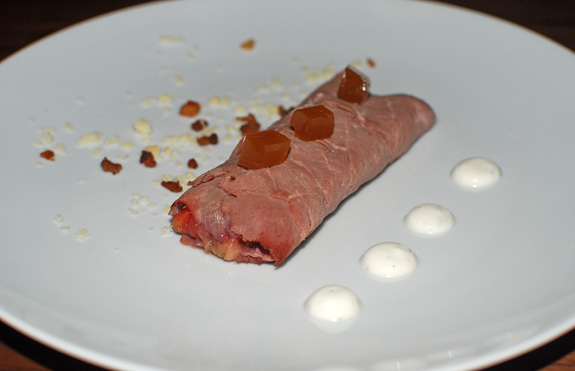 The smoked beef tongue was another melt-in-your-mouth success. I’m not always fond of beef tongue, but this has to be the best one I’ve ever had. The rich, delicious jus and the pickled onions didn’t hurt either. Too bad the yellow pea purée totally lacked salt and tasted rather watery for something that was sold to me as being full of butter. 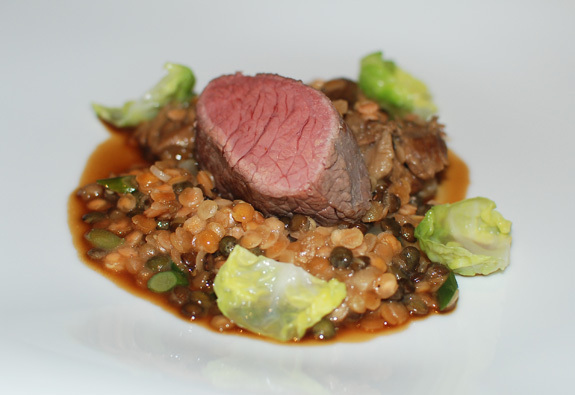 The lamb leg with lentils was very well cooked and had a good lamby flavor, although as with the pea purée, the lentils lacked salt. 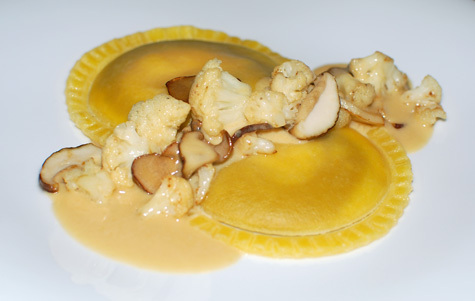 The porcini and egg yolk ravioli — they call them “pasta pockets” — on the other hand, turned out to be problematic. We actually returned the dish because the pasta itself was very undercooked, and the second time around it was still barely cooked but with the egg yolk overcooked. The dish tasted like mushroom but not all that much like porcini (I wonder where they got their porcini from when I’ve been looking for some without success over the past month), and compared to the big yolk, there wasn’t enough mushroom mixture inside the ravioli. 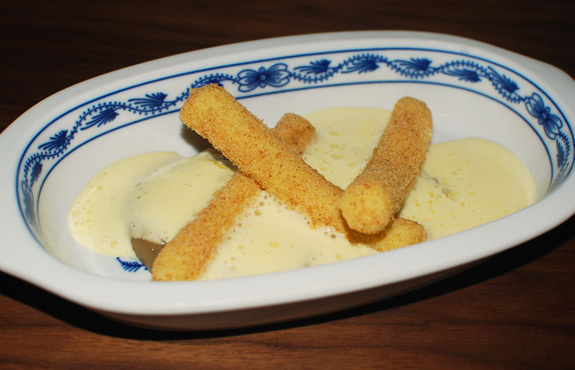 The dessert menu offers a short selection of Czech and not-so-Czech dishes. 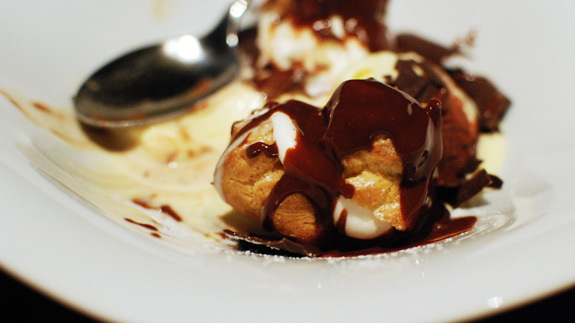 The profiteroles tasted fine but were disappointing — not disappointing enough to stop us from cleaning our plates under 2 minutes, though! The choux puffs were hard and not puffy enough. They weren’t filled with vanilla ice cream but with whipped cream instead, and the ice cream was served on the side. 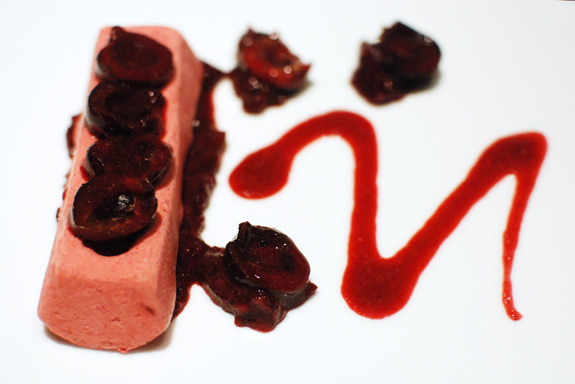 The cherry variations consisted of cherry sorbet, preserve and sauce. The sorbet, which was more akin to a parfait, was the strong point of this tasty dessert. It had a great, almost chewy texture. 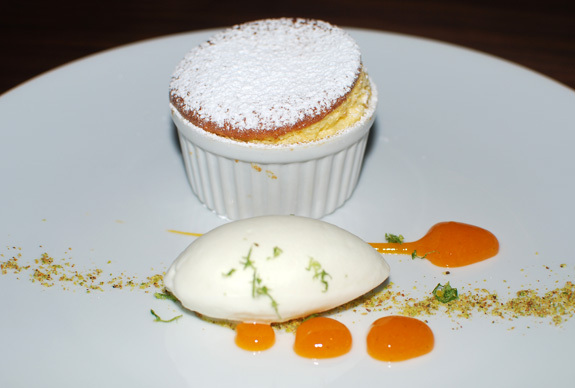 The apricot soufflé with lime and fromage blanc ice cream was equally good, if only a bit too small. All the flavors worked well together. More traditional were the potato noodles. While the pear jam and rum custard that came with them were both very good and the plate very pretty, the noodles themselves were rather plain and heavy. Despite the little ravioli incident, the salt level of certain items and the on-going tweaking of some dishes, Hospoda is definitely several steps above all the other Eastern European restaurants in town, especially for the attention it pays to textures, presentation and cooking techniques — not to forget taste, of course. The restaurant easily lands my highest rating so far! It’s worth mentioning the Bohemian Hall’s long history. 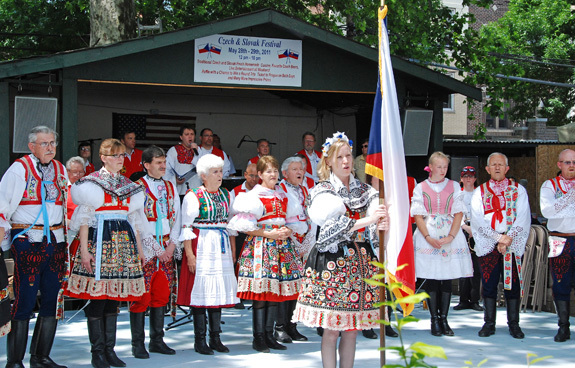 At the end of the 19th century, many Czech and Slovaks fled Austria-Hungary and settled in Astoria. 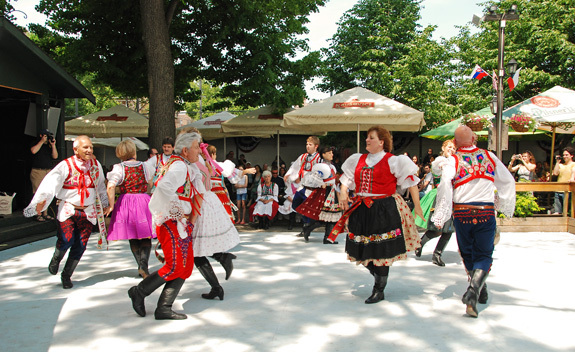 In 1910, the community purchased farmland and turned it into an authentic European beer garden, which has survived for over 100 years. Of course, we didn’t come just to watch grown-ups gesticulating with hatchets. 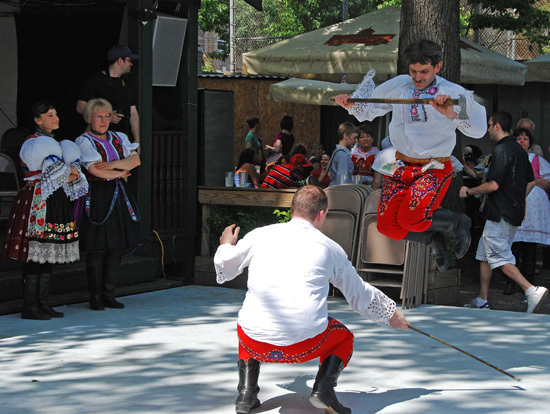 We were also there to taste the food, and the Bohemian Hall offered a special menu for the duration of the festival. Since the dishes were prepared in advance and kept on a steam table, it would be unfair of me to make a formal review. So here is a short account of the things we tried. 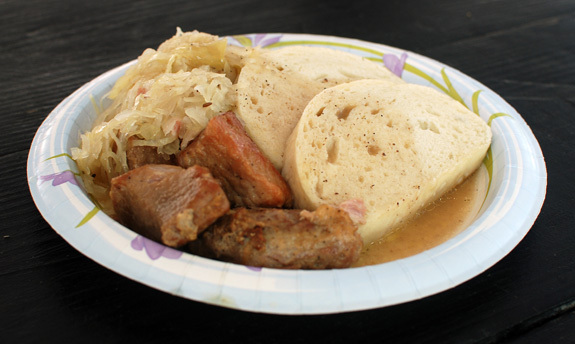 The Moravian stew, with its traditional bread dumplings, consisted of tender cubes of pork in a caraway sauce. Quite nice. Later in the afternoon, a long line formed as the outdoor grill started serving sausages and burgers. 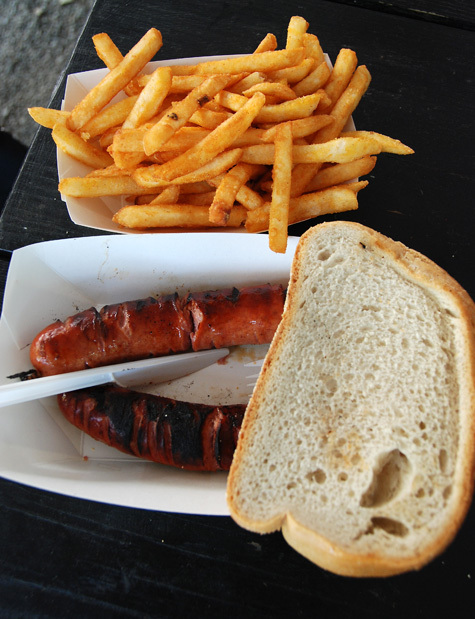 Here’s the country klobasa with fries. The klobasa was smoky and juicy, just how I like it. The crispy fries weren’t bad either! 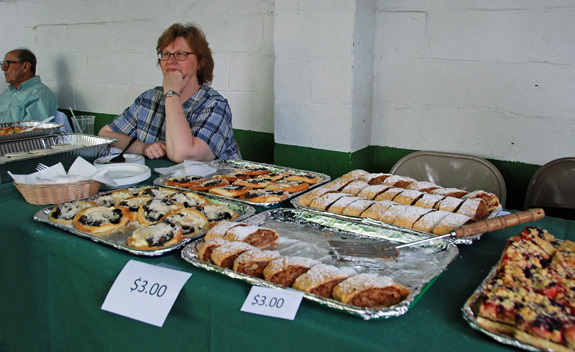 There was even a welcome dessert stand, selling apple štrúdl, prune and cream cheese koláč, and a mixed berry cake. We only had room for the strudel, which, unfortunately, was dry and embraced the unpleasant American habit of drowning all apple desserts with cheap cinnamon. 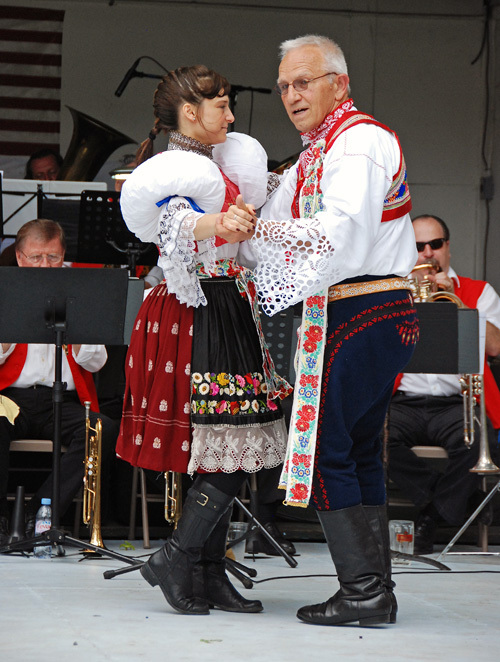 All in all we had a very nice time at the Czech and Slovak Festival. But one final complaint: $8 for a shot of plain vodka is way too much money!